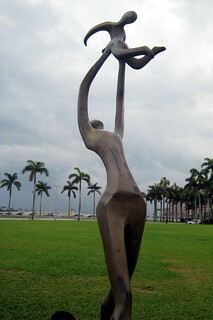 Mehri Danielpour's seven-foot bronze sculpture, Year of the Child stands on the grounds of the West Palm Beach Public Library, honoring the International Year of the Child, 1979, as proclaimed by the United Nations. The piece, depicting an abstract full-length female figure holding a child in her upraised arms, was donated by Mr. & Mrs. Harold Kaplan. Mehri Danielpour was born in Teheran, Iran and immigranted to the United States with her parents at the age of eight where she was raised and studied in New York until moving to Florida. In the years 1968 to 1970, Mehri was asked to go to Iran to create busts of Her Majesty, Empress Farah of Iran, His Majesty, the Shah of Iran and Crown Prince Reza, then nine years of age. All the sittings were done at the Saadabad Palace in Teheran. Mehri also created a small commemorative bust of the Empress that was given to every visiting Head of State for the 2500-year celebration of the Persian Empire. Since 1970, most of Mehri's sculptures have been commissioned work for portrait busts of adults and children or full-figures of children.